There have been more yet developments in Sherwood since I wrote about Rikshaw in the Summer. Mostly drinking establishments like the Crafty Teller, Hugo’s and Jenkins. The other new arrival is the Pudding Pantry, much to the delight of those already competing for your breakfast pound. Although they do offer something a bit different from the likes of The Crimson Tree and The Bakehouse. In fact their demographic was not difficult to discern on the weekend morning that I went. Children. This is understandable, it is puddings, pancakes and milkshakes rather than a hipster hangout. In truth I’m not sure where I would feel more at home. They do offer the whole range of options though, almost too many I thought as I leafed through the menu struggling to choose. I wanted to try something that played to their strengths so I went for pancakes – but I also thought I’d test their traditional breakfast credentials. 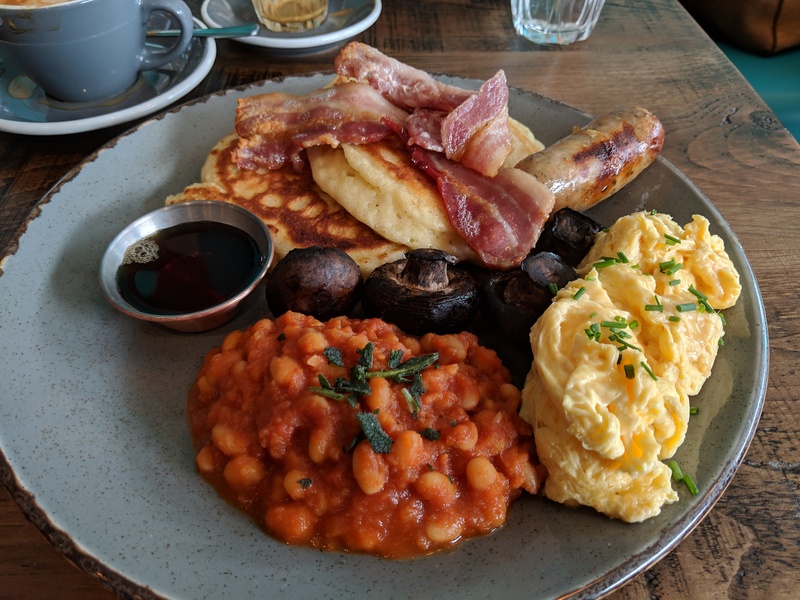 “The Full Pantry” gave me that opportunity, basically a full English with an added stack. I was offered the choice of egg and plumped for scrambled. I struggle to put into words how bad it was. It was almost solid and I needed a knife to cut some chunks off. When I did manage to get into it there was not a granule of seasoning, certainly no specks of pepper and I am pretty confident salt was entirely absent too. Mushrooms weren’t much better, large button ones that had been cooked whole but for nowhere near long enough. The inside was practically raw, the flavour also lacking having not had time to develop. The truly awful out of the way I am pleased the say the beans were fine, if particularly sweet. The bacon and sausage were pretty decent too. Fortunately the pancakes were excellent, fluffy and light where American-style ones can so often be stodgy. I observed that most plates coming out of the kitchen were pancakes, fortunate for those diners given my experience with anything more adventurous. Later I decided rather than their fortune it was my stupidity to choose anything other than what you would expect the Pudding Pantry to be good at. That doesn’t excuse the lacklustre effort of a Full English but I would return again for one of their pancake dishes. As for my bacon fix? Up the road at The Bakehouse is still the place in Sherwood for that.